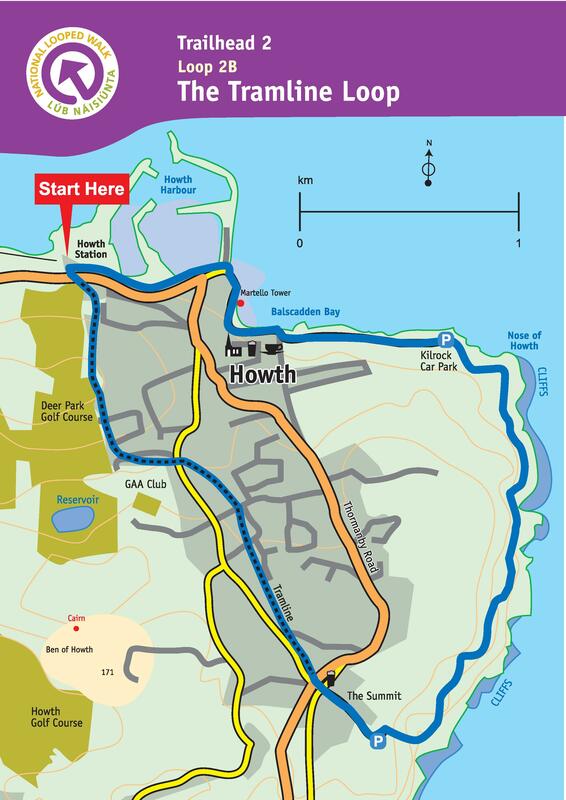 The following is the Howth Tramline Loop Walk taken from fingaldublin.ie. 1. Starting from the DART Station follow the blue arrow onto the promenade along the harbour. You are also following green, red and purple arrows which are for other loops. At the end of the prom, veer right onto Balscadden Road and ascend to reach Kilrock car park from where you join the well trodden cliff path. 2. Follow the cliff path for approximately 3km before turning right (leaving the longer purple loop) and ascending to reach The Summit car park. 3. Exit the car park through the height restriction barrier and join Bailey Green Road. Follow this road downhill to reach a junction of roads at The Summit Stores and pub. 4. Directly across from the bottom of Bailey Green Road, the entrance to the old tramline is marked by stone bollards. Cross Thormanby Road and join the tramline pathway. Follow the pathway downhill to exit directly opposite the DART Station – picking up the green, red and purple loops along the way.